Global Concrete Admixtures Construction Chemicals Market revenue is expected to reach $16,324 million by 2023, from $11,027 million in 2016, with a CAGR of 5.7% from 2017 to 2023. Cement is used as a binding material in construction. Concrete admixtures are ingredients that are added to the concrete before or during blending for high workability, high strength, durability, watertight, wear resistant, and high finish. Various types of admixtures used in concrete are fly ash, silica fume, rice husk ash, superplasticizers, normal plasticizers, waterproofing agents, air-entraining agents, water-reducing agents, retarding agents, hydration-control agents, accelerating agents, anti-corrosion agents, coloring agents, and others. Three types of admixtures prevalent in the market are ligno-based, sulfonated naphthalene formaldehyde (SNF) & sulfonated melamine formaldehyde (SMF) based and polycarboxylate ether (PCE) based. Ligno-based admixtures were the first-generation admixtures with lower performance as compared to SNF & SMF- and PCE-based admixtures. The global concrete admixtures construction chemicals market is segmented based on type, application, and geography. Based on type, the market is bifurcated into mineral and chemical admixtures. Based on application, itis classified into residential, commercial, infrastructure, and repair structures. Geographically, itis categorized into North America, Europe, Asia-Pacific, and LAMEA. Asia Pacific is anticipated to grow at significant rate from 2017 to 2023. Emerging countries, such as China and India, offer lucrative opportunities to market players, due to the growing urbanization and industrialization. Thus, significantly large population base, rise in construction activities and increase in disposable income are expected to drive the growth of the market in this region. Residential complexes and buildings are in high demand in response to the perennial urbanization globally. Construction firms initiate comparatively larger number of residential projects with high-grade construction materials to provide improved structural integrity and sustainability. Residential segment is the most lucrative market in the concrete admixtures construction chemicals market and is expected, to grow at the significant CAGR during the forecast period. Infrastructure segment is the second accretive market in global concrete admixtures construction chemical market. Chemical admixtures segment accounted for the largest share in concretes admixtures construction chemical market, owing to its high strength, excellent workability, high performance, and durability. It is expected to grow at a high CARG during 2017 to 2023. The emergence of new markets in the LAMEA region has boosted construction schemes and elevated the living conditions of the population. The rise in urbanization and increase in living standards of people in Brazil is responsible for the growth in residential structures. As per the Brazilian Institute of Geography and Statistics, in 2012, the construction industry in Brazil accounted for about $109 billion. Further, growth in the construction industry is expected to drive the concrete admixture market in Brazil. Some of the key players operating in the global concrete admixtures construction chemicals market are BASF SE, Arkema SA, Ashland Inc., Fosroc International Limited, Mapie S.p.A, Pidilite Industries, RPM International Inc., Sika AG, The Dow Chemical Company, and W.R. Grace & Company. 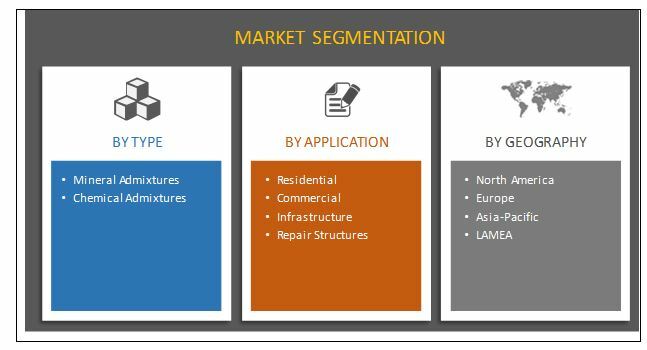 Other key concrete admixtures construction chemicals market players (not profiled in this report) in the value chain include CEMEX S.A.B de C.V., Conmix Ltd., CICO Technologies Ltd., and Chryso S.A.S. This report provides the quantitative analysis of the current concrete admixtures construction chemical market and estimations through 2015-2023, which assist in identifying the prevailing market opportunities. Extensive analysis of the current and emerging market trends and dynamics in the global concrete admixture construction chemical market is provided. An in-depth analysis of current R&D within market is provided to understand the behavior of the market. Extensive analysis of segment by product type helps in understanding the current packaging materials being used and the variants that is expected to gain prominence. Detailed analysis is conducted by following key product positioning and monitoring the top competitors within the market framework. Concrete admixtures construction chemical are materials that help to optimize the performance of concrete by offering high workability, high compressive strength, durability, watertight, wear resistant, and high quality concrete finish to meet the requirements of complexity of modern structures. It offers unique characteristics to concrete such as, retard or accelerate time of initial setting and improves pumpability and thus saves energy. Factors that drive the market are growth in demand from construction industry and need for sustainable and energy conserving materials. Moreover, the need for better infrastructure has increased, owing to rise in investment and high disposable income, which further fuels the demand for concrete admixtures construction chemical. Rapid urbanization leading to the establishment of numerous industries, housing, and commercial projects in India, China, Brazil, and Middle East has positively impacted the market growth. This trend leads to potential growth opportunities for concrete admixtures construction chemical market during the forecast period. "Concrete Admixtures Construction Chemical Market"